Re-makes are not really my thing. The Ben-Hur movie of 2016? Woof. Crystal Pepsi? Trying too hard. Every Disney animated movie ever now coming back as live action? NO. So when I heard that there was now an entire tabletop game company, Restoration Games, devoted to remaking* classic games, I was … skeptical. Then I heard about Downforce. And my inner 10-year-old demanded a play though. Downforce’s original incarnation was known as Niki Lauda’s Formel 1, designed by Wolfang Kramer, and released in 1980. But my inner 10-year-old (and you, probably) knows it as Daytona 500, the Milton Bradley NASCAR-licensed classic which was given to me for Christmas in 1990 and still holds an honored place on my game shelf. * To be completely fair, I should note that the company is careful to always say they are “restoring” these games, not “remaking” them. Oh, some of you really didn’t play it? I’m sorry your childhood was so deprived. Well, okay, I guess can explain how Downforce plays. The object of the game is to win the most money; not necessarily to win the race. At the outset, you conduct a blind auction to determine who owns which car(s). All six race no matter how many humans are playing. 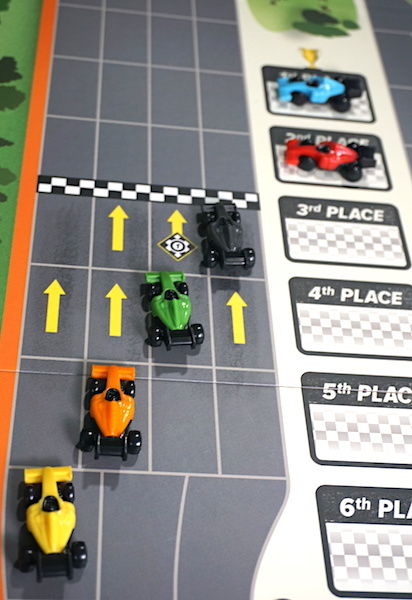 The race then begins with each player playing one card at a time from their hand to move the cars. Most cards move more than one car, including cars you do not own, so you have to be strategic about when and which card to play. Thanks to twists and turns in the race track you can block cars from being able to move their full amount allotted on the card – or even from moving at all. If a car you own crosses the finish line first, you win a cool $12 million. Second through fifth earn successively smaller prizes. So far this is Daytona 500 exactly. 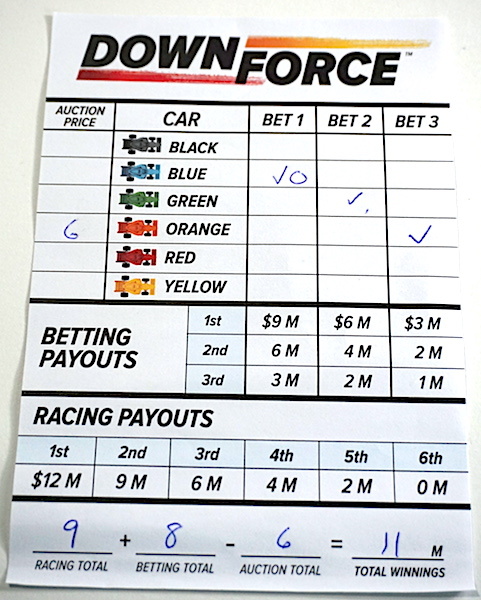 But Downforce also includes “betting”. Since you don’t lose anything when you bet wrong, I’d more accurately call it “backing”. Three lines on the track mark the point at which bets are recorded. Pick the eventual winner, and you get even more moolah. Consolation moolah is yours if your pick comes in second or third. 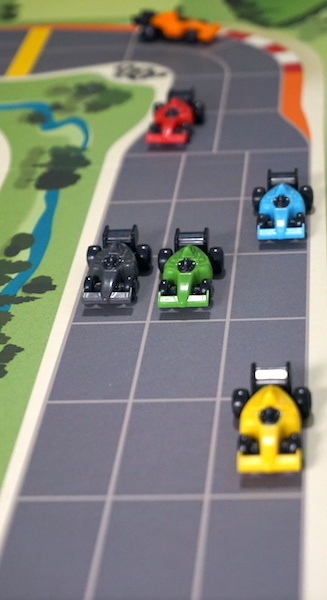 There’s actually more money to be made in the bets than in winning the race, so it is very possible for your cars to come in third or fourth but still win the game. I particularly enjoyed this aspect because it led to some very interesting strategic choices toward the end of the game. Should I play a card that moves my car farthest? Or should I choose a card that moves me only a space or two, but helps keep the car I bet on well in the lead? In one game, I purposely delayed crossing the finish line with my own car in order to help the car I backed catch up and still finish in a respectable second. Two features aid replayability. First, two tracks are available, one on each side of the board. This allows you to mix it up a bit with how far it is to the first turn, how long the straightaways are, etc. (This was Daytona 500’s greatest weakness, I think – it was only one track, and it was an authentic tri-oval shape, with only two turns). Second are the special abilities. 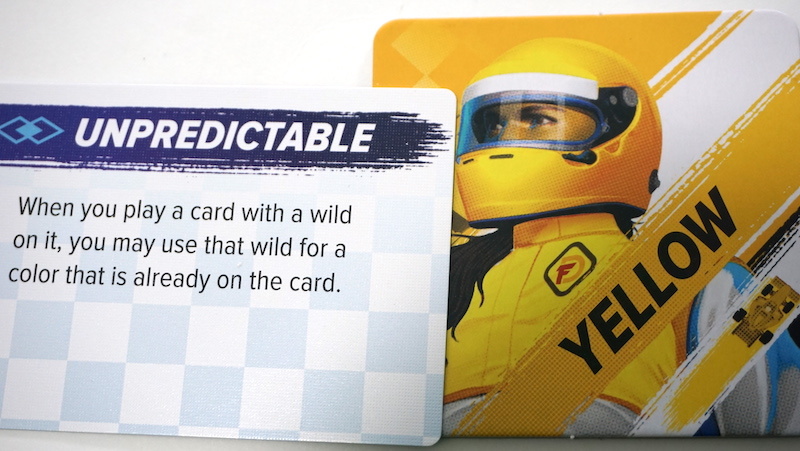 When you bid in the blind auction for the cars at the beginning, you also win one of 6 special ability cards. At the end of the auction you choose one. This superpower is permanent and all of your owned cars are affected. 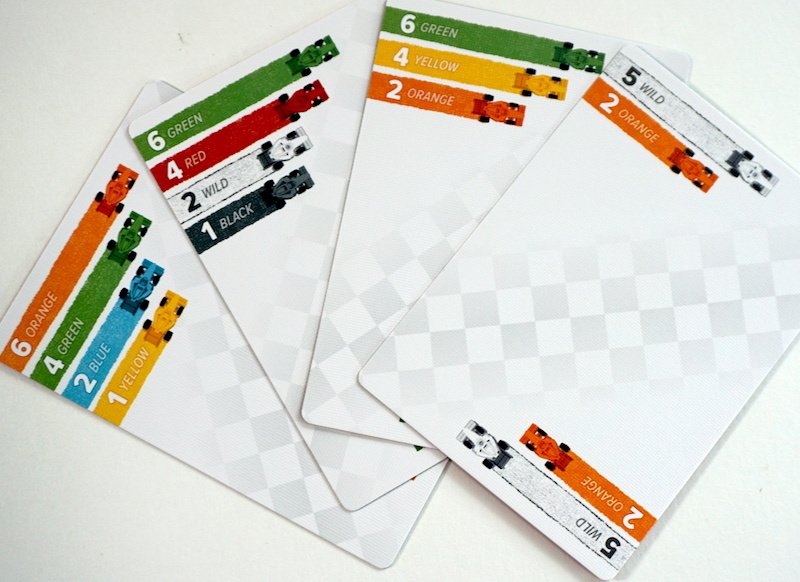 You might get to move bonus spaces if you’re in a straightaway, or ignore one color on a card when you play it. You know what else makes you want to replay this game? It’s fast, and it’s fantastic fun. Simple as that. The box says the minimum age is 14; we completely ignored it. My 6-year-old struggled with some of the finer points of the mechanics. The 9 and 10-year-olds held their own with minimal coaching on the first play through. The equalizing effect of the three betting lines really shines when playing with kids. Even if the adult-owned cars are way ahead, the kids stay engaged and in contention if they make smart picks. Or, I suppose, they could just help the car owned by their favorite parent – so maybe you should give that kid a cookie before sitting down to play. So instead of blowing those $40 in your pocket on the next Robin Hood remake (ugh), may I suggest you spend it on Downforce instead? I guarantee you will have more fun – and your childhood will thank you. 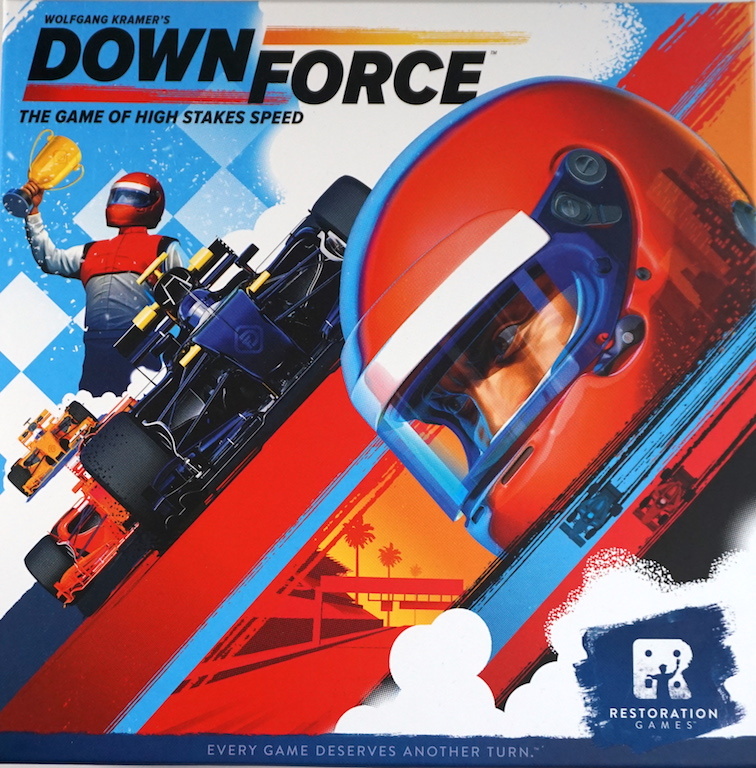 You can order your own copy of Downforce here.